How can I come out of all this? I want to know is there a specific kaffara for breaking a very important promise? I have broken a promise and I am in too much guilt n distress.is there a specific way to pay kaffara for this? Without knowing more information, it's difficult to give an answer specific to your situation. I'd advise that you read our published articles about Tawbah and repentance, as they may help you inshaAllah. 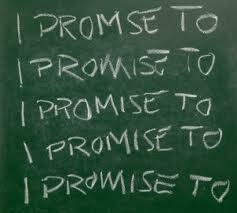 The word "promise" is very general. If one makes a promise to a friend, for example, "I promise I will help you study on Saturday," then breaks that promise, there is no kaffarah for expiation for that, though it is still a sin (if there was no good reason for breaking the promise) and one should say istighfar. Kaffarah or expiation is required in Islam when one breaks an oath on Allah's name. In other words, when one says, "Wallahi", or "I swear by Allah that..."
Salam alaekum, thanks for your clarification ustaz, but i want to known the basis on why kaffaratul yameen should be based on saying wallahi in our promise. jazakumullou khaeran for your patience. My understanding is that the very nature of an oath in Islam is that it means to swear by Allah. Saying, "I will do it," or, "I promise to do it," is not an oath. Swearing by Allah is a very serious thing for a Muslim, because he is swearing by the One who sees and hears the truth, the One who rewards and punishes, the One who enforces the keeping of the oath. Therefore to break such an oath is equally serious. I don't understand what you mean, by "promise of my papers"? If the promise was for something haram then you have done nothing wrong by breaking it. If the promise was for something good then make tawbah to Allah, apologize to your friends, and in the future try not to promise things you cannot deliver. I promise to ALLAH that i can't listens songs again but i broke my promise i 'm very upset for that what i should do now? Answer?? Amna, please read the answers already given in the comments, thanks. I took her and kid's swear am in guilt I was scared my wife will hurt and I love her smooch I don't want her have anything bad for me in her heart I love my kids and wife so much am in guilt even it was joke but sure I should not had did that joke and top of that I took jhooti qasam I have asked my Allah forgive me but I got scared cuz I did wrong If. there any kaffara for that I have asking my Allah for forgive and I will never do like this again ever. Question: I was in love with a girl. And Alhamdulillah Allah had protected both of us from any haraam even when we were together.... When we were together I made a promise to her that I will marry you, and i will never let you go and so on. And now we are no more together due to our arguments/issues. I have broken my promises. What do I do? I read on the internet somewhere else that the person should fast for 3 days or feed 10 people (two meals each)...Is this true?. Please brothers and sister if you have the answer to my question then do let me know. I fear soo much and feel so depressed that I have broken my promises? ?